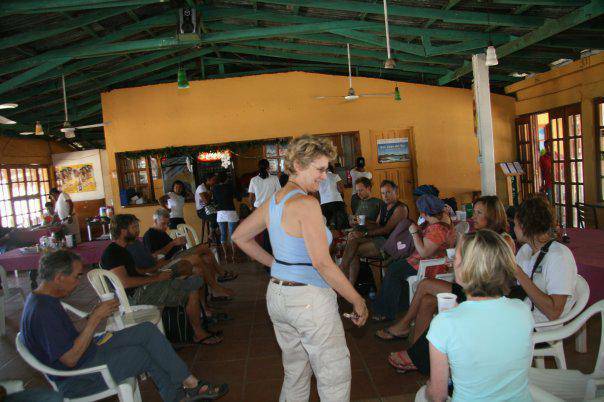 Every weekday, SSS offers a different afternoon activity. 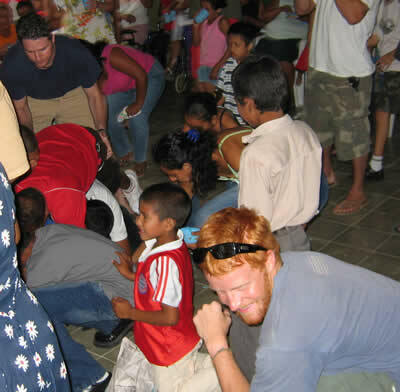 These activities give students the opportunity to practice their Spanish in social settings and learn about Nicaraguan culture. 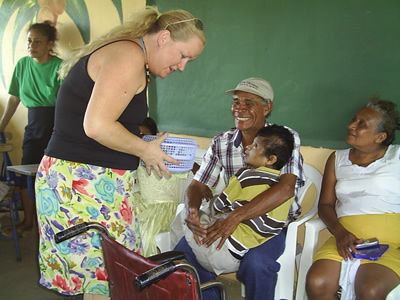 Scroll down for information about incredible volunteering opportunities with local Nicaraguans including special needs children. 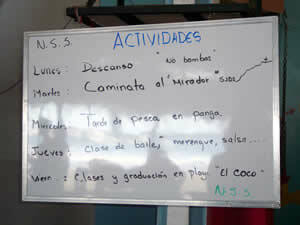 A day of classes at Remanso beach, surf board included! Please note: Activities are Mon - Thurs. There may be an extra fee for some activities and on weeks where there are fewer than eight students at the school. 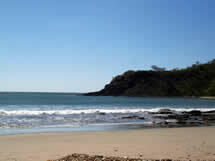 One of the beautiful local beaches of San Juan del Sur. 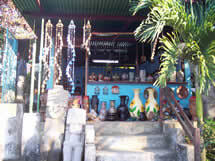 One of the shops in San Juan del Oriente, an artisan town and favorite among students. 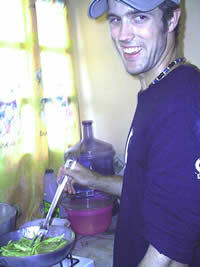 A student at SSS enjoys a cooking class. SSS students learning new dance moves! A portion of your tuition benefits local children with disabilities! 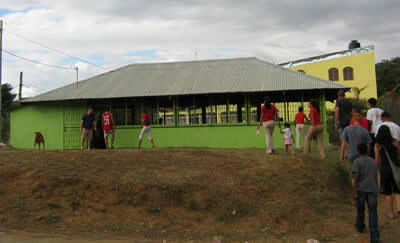 Contributions from the SSS school and its students have provided electricity, classrooms, supplies and bathrooms for a nearby school for local children. The school still desperately needs additional supplies, such as clean drinking water for the children, and a safe place for them to play. If you are interested in helping local Nicarguan children who are living in poverty, please email us or stop by the school. 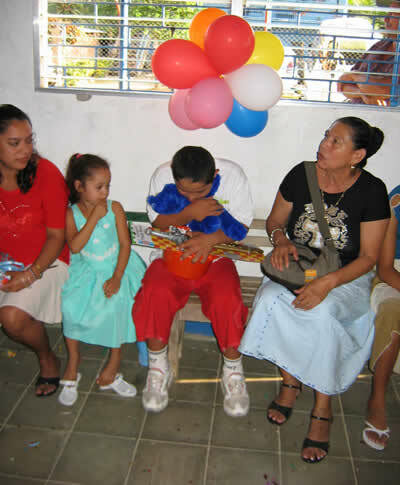 "Los Pipitos” is the name for the local special needs school in San Juan del Sur; it is a small school funded by Nicaragua Children's Foundation and San Juan del Sur Spanish School. The school has been running since 2007 and has about 18 students with varying learning difficulties; these problems include Downs Syndrome, epilepsy, hearing impairments, speech and language difficulties and many more. All students are educated in the same classroom but their ages differ greatly including the fact that there are many adult students as well. This project has done incredibly well to get started and is an excellent facility for the town but has lots of room for improvement. Become a part of the project even if it is just for a week; it is a great place to practice your Spanish, whether you are a beginner or advanced, its a great way to be involved in the local community and above all a great way to support the work of the Foundation and the Spanish School. If you are a teacher or have experience in working with people with learning difficulties think about what professional ideas you could bring to the project but if you don't have experience don't worry your help will be welcomed and you will be given some ideas of how you can help from the school. Before you leave for your trip to Nicaragua have a think about some resources that you could possibly bring from your country; in Nicaragua it is difficult to find resources such as children's story books (in Spanish), colouring in books and other learning aids so if you could find some room in your suitcases they would be gratefully received. The project doesn't just stop with the school, the SSS School and the foundation also help disabled people within the town who cannot physically attend the school. 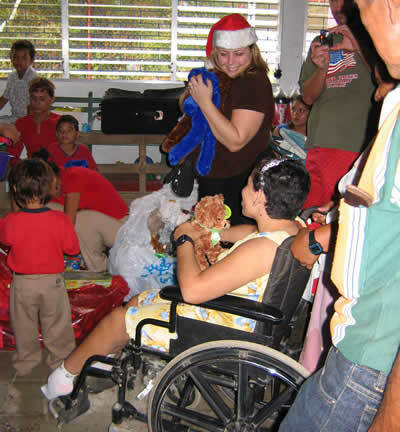 Accompanying one of these visits shows a very different side to San Juan del Sur, one of poverty and desperation. Delivering some nappies or simply sitting and having a conversation with the families can mean the world of difference to show that you care. There is also opportunity to sponsor someone in need if you are able to but there is certainly no pressure to do so. This is a great volunteer opportunity and a fantastic cultural experience. A local special needs child and family enjoying time with an SSS student. A portion of the proceeds benefit children with disabilities and other social projects. 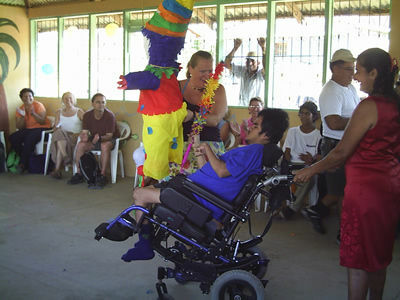 Pictured above is one of the children and an SSS student playing with a piñata.